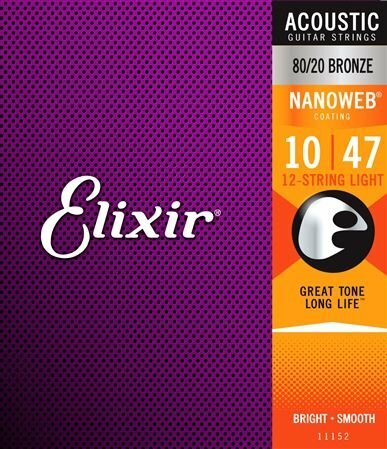 Shop Elixir 11152 NanoWeb 80/20 Bronze Acoustic Guitar String 12-String from AMS with 0% Interest Payment Plans and Free Shipping. Elixir 12 String Nanoweb Acoustic Guitar Strings give long life and great tone to your 12 string acoustic! Elixir Strings with ultra thin NanoWeb coating provide you with an excellent string life-span lasting 3 to 5 times longer than ordinary strings. Keeping it's incredible tonality you will find yourself having to change your strings less often. Delivering all the brightness you get with standard non-coated acoustic strings, Elixir Acoustics are the best so why settle for the rest? Articulate strings with a Traditional feel! The Cure for the Common String. Elixir Strings are coated in a unique way to protect wound strings from your DNA and other contaminants. A flexible, strong, yet micro-thin polymer tube defends the Critical Zone of Tone from invading enemies. Nothing (including the coating) gets between the windings. The result? Strings that sound and feel their best three to five times longer than ordinary strings. Elixir Strings are only available for shipment to addresses in the United States, US Territories & Possessions, and APO FPO destinations. The only acoustic string I’ll use. Best tone, life and dependable as hell.